His resume reads like that of job-hopping millennials but 85-year-old Johnnie Franklin Siregar has clocked up more years in the workforce than they have been alive. He has certainly touched a few bases in his many and varied careers - starting out as a detective with the Singapore Police Force before becoming a salesman and a relief teacher. Mr Siregar, a grandfather of four, has taken another radical turn and is now the oldest guide at an exhibition about active ageing that opened at the Singapore Science Centre three weeks ago. The role involves introducing visitors to experience booths and displays that allow them to feel what it is like to go through the different stages of ageing and to think about what it means to age well. A more prominent reference point for the visitors is, of course, Mr Siregar himself, who is still part of the workforce though he crossed the minimum retirement age of 62 around 23 years ago and never gave the notion of quitting work a moment's thought. His latest post is one he finds meaningful because he can share his experiences with the younger generation. He said: "As long as it helps people, I am all for it." 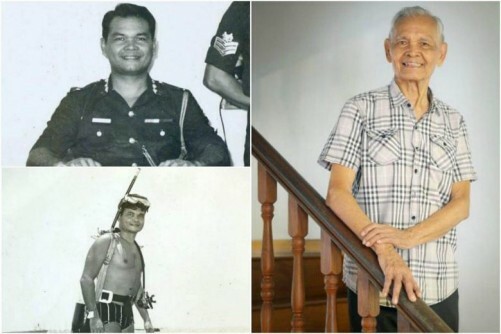 Mr Siregar's stint at the Science Centre is his ninth job since he started working in 1952 after leaving the Malayan Union Seminary in Upper Serangoon. Fresh out of school, he applied to the Singapore Police Force to become a detective. He said he was picked because he could speak Batak, a language spoken in his home town in North Sumatra in Indonesia. Mr Siregar registered to become a Singaporean when he wanted to try for the post of station inspector, a requirement then. He got the promotion, eventually retiring from the force as a station inspector at the Police Academy 26 years later. His next move was to start studying for a diploma in business studies at the Singapore Institute of Management to understand how the private sector worked but he did not complete the course; a new job came calling. In 1978, a sound equipment company offered him a job as an assistant manager, a position that allowed him to hone his marketing techniques in a work environment that was a lot flatter than the top-down approach he was used to in the police force. He said: "I also learnt how to think from the customers' point of view." At the time, many companies had a build-and-they-will-come approach so he was glad that his firm was not like that. He had to explain to customers how the speakers that he sold would fulfil their household needs. The task required him to understand the speakers' technicalities and how acoustics would work in his customers' households. Mr Siregar excelled enough at his first job in the private sector to earn a transfer and a promotion within a year. He became managing director at the company's new branch in Kuala Lumpur, where he ran a team of eight. His people skills served him well in the Malaysian capital. When he introduced himself to the trade and industry authorities, he spoke in Malay to build camaraderie and to earn their trust. "Of course, the technical details of the sound system had to be in English," he said, with a laugh. But the trust had been built by then, he added. One of his favourite pastimes in KL was to play golf, a useful pastime given that most of the deals were made on the links, he said. "We played nineteen holes, the last hole was the drinking hole." But the promotion also meant longer working hours and more entertaining. His health was affected as a result. Mr Siregar decided to come back to Singapore, where he found new jobs selling vacuum cleaners, fire extinguishers and timeshare property in Australia. Lugging vacuum cleaners up and down flights of stairs to perform demonstrations to prospective customers in their homes was back-breaking work. "Coming down was worse because of the pull of gravity," he said. He figured that fire extinguishers were lighter (they were). After a while, he wanted to try something new so he decided to try selling timeshare property in Australia. He got out of the industry when it started to get crowded. That heralded another change. His wife Tien Mei Lin, a former teacher, suggested relief teaching. He decided to give it a try, and he landed a position at Ghim Moh Primary School. Again, he tapped his skills in connecting with people to reach out to a Primary Five class that he described as not being very interested in books. During his first days, he noticed that the roots of their hair were dyed while the outer strands were black. "They were ah bengs and ah lians during the weekend," he said, using Hokkien terms used to describe local wayward youth. So he told them stories. One was about what to do when faced with a tiger, he said, chuckling at the memory. "Never turn your back and run! That leaves your neck exposed, and the tiger will come for you." He got along well with the class, getting into gardening at one point because some pupils were involved in the school's gardening club. The school then offered him a role as a form teacher, which he took on until later that year when he was displaced by a graduate from a teachers' college. But Mr Siregar did not let go of his new-found love for teaching. In 1997, he became a teacher for the remedial adult education Best and Wise programmes organised by the Institute of Technical Education. Those programmes were eventually phased out in the early 2000s but Mr Siregar took that in his stride and promptly became a trainer with a workplace literacy programme accredited by Workforce Singapore. He has been with the programme since it started 10 years ago, teaching general work skills such as writing memos and how to answer phone calls in a professional manner. But he gets fewer assignments these days because the company running the courses is downsizing, he said, adding that he is waiting for news on his next class load. Now, at 85, he has embarked on a new adventure at the Science Centre. He said: "I am very happy that I am not a burden and I am still contributing to society. "I want to continue living longer, healthier and happier."